Home » Formula One: Rosberg romps to victory as new era begins! Nico Rosberg has won the 2014 Australian Grand Prix; the opening race of season and the first race with the new V6 turbocharged engines. Rosberg was left somewhat unchallenged after team-mate and pole-sitter Lewis Hamilton retired early on. Reigning champion Sebastian Vettel also didn’t finish the race due to his engine having a lack of power. The drivers had to embark on a second formation lap prior to the Grand Prix after the two Marussia’s had problems on the grid, Max Chilton on the first formation lap and Jules Bianchi causing the second. Both cars were pushed into the pit-lane and started the race behind Romain Grosjean. When the race did get underway, Lewis Hamilton bogged down and had an awful start from P1 on the grid. Nico Rosberg on the other hand launched his Silver Arrow off the line well from 3rd to lead into turn 1. 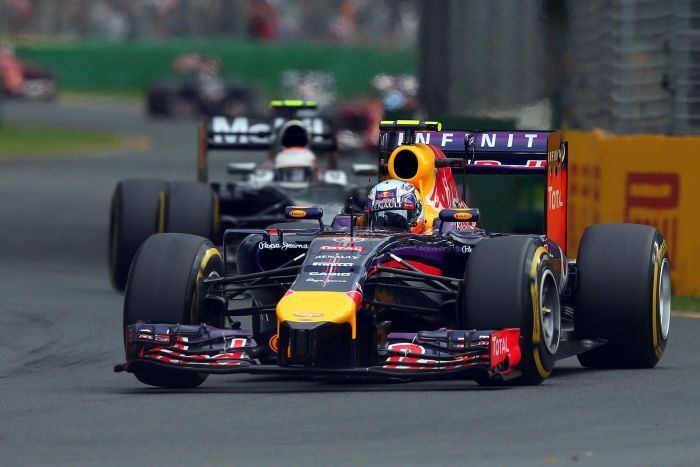 Ricciardo followed Rosberg through and maintained his 2nd position. Kevin Magnussen almost ended up in the barrier after a sudden burst of wheel-spin which sent him sliding across the track. The rookie managed to gather the car up and held 4th into turn 1. Kamui Kobayashi’s return to Formula One didn’t last long as he locked up into turn 1, clipping Raikkonen’s Ferrari and punting Massa’s Williams into the gravel. Raikkonen didn’t suffer any damage miraculously, but Kamui’s front wheels had been severely damaged and Felipe was stuck in the gravel. Kobayashi went on to admit that it was all his fault, whilst Massa expected that a penalty should be given to the Caterham driver. Reigning champion Sebastian Vettel had reported that he was lacking power on the formation laps. This problem actually helped Sebastian to avoid all the carnage after his awful getaway from the grid. You wouldn’t have believed that Kevin Magnussen had just started his first race in Formula One when he got around the outside of Lewis Hamilton at turn 9. The Dane was aiming to replicate Hamilton’s first race in 2007 when he put his McLaren 4th on the grid and finished 3rd. It wasn’t purely down to Kevin being faster however, as soon after Lewis was told by the team that he would have to retire his car! The team quickly backtracked on this request and told him to stay out, but the Mercedes didn’t last much longer. Hamilton pulled his car into the pits on lap three and retired from the race due to a misfiring cylinder. Hamilton’s team-mate was having a much better race out at the front, with Rosberg setting the fastest lap as he pulled away from Ricciardo and Magnussen. Valterri Bottas was in another fast car as the Finn pulled off a beautiful move around the outside of Vergne at turn 3. He continued his attacking drive with a move on Raikkonen at the same turn a few laps later. Sebastian Vettel’s car was a stark contrast to that of Rosberg and Bottas as he continued to struggle with a lack of power. The reigning champion had reported that it was starting to get better, but pretty soon he was back on the radio saying: “Do something I have no power!” The team could do nothing, so he had to pull his Red Bull into the garage and into retirement along with Hamilton. Bottas was continuing to make gains in his Williams and looked like he could make his way to the front of the pack. But he pushed to hard out of turn 10 and clipped the barrier on the outside. The contact looked minor, but it took the rubber of his right rear tyre clean off of the rim and forced the Finn into the pits. A stroke of luck saw the Safety Car emerge to collect debris from the circuit. Jenson Button was in the right place at the right time and made a late dive into the pits. All of the drivers decided to follow the 2009 champion in, with Jenson moving into 6th as a result of his team’s excellent call to pit the Brit early. Rosberg’s restart was a text book performance as he danced away from Ricciardo and Magnussen. Grosjean made up a position on Ericsson as the Lotus continued to exceed expectations by continuing to run. The Frenchman lost a position to Perez a lap later, but it was definitely and improvement on the team’s qualifying performance yesterday. The Williams of Bottas looked to be recovering well apart from a short problem with DRS. The team managed to get the rear wing flag to work again to allow the Finn to pass Russian rookie Kvyat on the start/finish straight. Rosberg continued to increase his lead at almost a second a lap over Ricciardo in 2nd place. Tyre management was impressive on his car, as despite a little graining on his front right tyre, the team stretched out his stint to a few extra laps to minimize the tyre degradation at the end of the race. Button once again was the first man to pit in his McLaren. It was a near perfect stop for Jenson, apart from a slight hiccup with the front jack-man. The jack appeared to get caught on the nose of the car, which removed the tip from the car. It wasn’t a major issue for Button, who commented after the race that the only effect was that it was a little colder. Bottas once again was making moves as he passed fellow countryman Raikkonen after the Ferrari driver ran wide into turn 10. The pair pulled into the pits a lap later, with the Williams crew managing to keep Valtteri out ahead of Raikkonen’s Ferrari. The main battle in the final stages of the race was for 2nd, 3rd and 4th place. Ricciardo and Magnussen had held 2nd and 3rd for the whole race, but Magnussen was starting to close in on the Australian. Button was also fast after his stop and was closing in on the pair of them in 4th. By lap 41, Magnussen was in the DRS zone of Ricciardo but struggled to get into a position to pass the Red Bull driver. 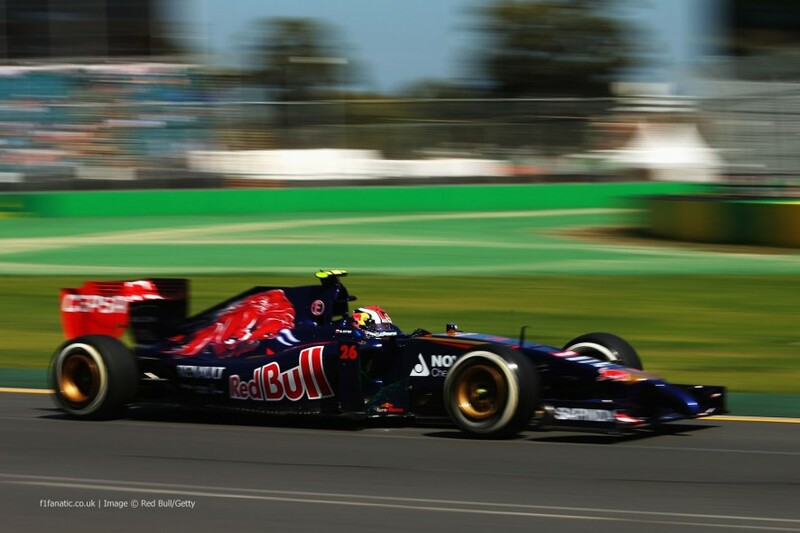 The Dane lost a little time to Ricciardo and was told to save fuel for a final push in the last few laps. He didn’t have to worry about his team-mate closing in on him, as Button soon started to ease off due to tyre degradation. At the front of the field, it was all looking very sedate for Nico Rosberg who appeared to be emulating his fellow German Sebastian Vettel by building a massive lead over second place. As he started the final lap of the race, he had built up a 24 second lead. He eased the car around the final lap and took an impressive victory, the first with the new engine regulations and first win of a new, exciting era of Formula One. He emulated his father Keke who took the first official Australian Grand Prix win back in 1985 at the Adelaide Street Circuit. The applause may have been reasonable for Rosberg, but it was nothing compared to the reception for home-hero Daniel Ricciardo. The boy from Perth held on to come across the line to rapturous applause and cheers from the crowd as he secured his first podium in Formula One in his first race for Red Bull. In 2007, Lewis Hamilton made his Formula One début with McLaren and finished 3rd after qualifying 4th. That performance was replicated today by McLaren’s newest rising star; Kevin Magnussen. The Formula Renault 3.5 champion secured his first podium in his first Formula One start and showed no signs of nerves He looked as though he was a seasoned veteran with a calm, calculated and fast drive on his first foray in F1. He’ll certainly be one to watch this season, with Hamilton having managed to just miss out on the championship back in 2007. Jenson Button managed to secure 4th place and seemed much happier than he was yesterday. He’ll be happy to be starting the season with a strong finish following a tough pre-season after the loss of his father who had supported him at nearly every Grand Prix of Jenson’s career. Fernando Alonso came home in a reasonable 5th place, but Ferrari know that they need to improve to be able to challenge for the title this season. 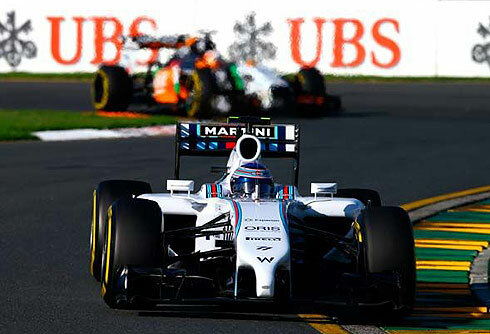 Bottas fought back from his touch with the barrier to finish in 6th position, securing more points in one race than Williams secured throughout the whole of last year’s season. Nico Hulkenburg finished 7th on his return to Force India, an impressive result baring in mind that Nico had never completed a racing lap of the circuit in his previous 3 attempts. Kimi Raikkonen followed him in 8th on his return to Ferrari after an average race for the 2007 world champion. The two Toro Rosso’s completed the points scoring positions, with Jean-Eric Vergne securing 9th place ahead of rookie Daniil Kvyat. The Russian broke Sebastian Vettel’s record to become the youngest world championship point scorer in Formula One history at 19 years 10 months and 18 days. Perez finished just outside of the points in 11th place ahead of Adrian Sutil in the Sauber. Sutil managed to pull off a one stop race, with the Sauber appearing to be very kind on its tyres. Team-mate Gutierrez was one place behind in 13th. Max Chilton was last classified finisher for Marussia in 14th place. Team-mate Bianchi was running at the end of the race, but was a large number of laps down on Rosberg which led to the Frenchman not being classified as a finisher. The Lotus cars retired from the race as they had been expected to, but they lasted a lot longer than people thought. Maldonado made it to lap 29 with Grosjean getting to lap 43 out of 57. Marcus Ericsson was forced into retirement with mechanical issues on his Formula One début for Caterham. He was joined by the aforementioned Sebastian Vettel, Lewis Hamilton, Felipe Massa and team-mate Kamui Kobayashi; who all retired near the start of the race. 14 drivers were classified as finishing the Grand Prix, which is more than previously feared in the run up to the event. *NOTE: Daniel Ricciardo is under investigation for exceeding the maximum amount of fuel flow over the course of the Grand Prix. At the time of writing, no decision had been made. A new article will be published regarding the decision when one has been made.